A cleft lip is a physical split or separation of the two sides of the upper lip. It appears as a narrow opening or gap in the skin of the upper lip. This separation often extends beyond the base of the nose and includes the bones of the upper jaw and/or upper gum. 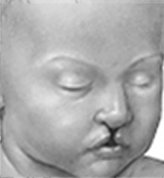 Cleft lip and cleft palate can occur on one or both sides. Because the lip and the palate develop separately, it is possible to have a cleft lip without a cleft palate, a cleft palate without a cleft lip, or both together. I have a new born with a cleft lip and palate. Where do I seek help? Will my child every be normal? How will the baby feed? Today with modern technology and expertise, any child born with cleft lip and palate can be made fully normal both in terms of form and function using a team approach by various medical and dental specialities.